Wildflower Meadows was specially commissioned by Arts for Rutland with support from the Arts Council. The music was composed by the Dulwich-­‐born contemporary classical composer, Thomas Hewitt Jones. He was an organ scholar at Gonville and Caius College Cambridge and went on to win the BBC Young Composers Competition in 2003. He is best known for his compositions to accompany the 2012 Olympic and Paralympic mascot films and has several contemporary choral and ballet works to his name. A regular collaborator of Thomas Hewitt-­‐Jones, Paul Williamson, wrote the lyrics for Wildflower Meadows. Song 1 is set in summer at the start of World War I. The Lindley Bell refers to the regimental bell of the Leicestershire Free Yeomanry, brought back after the Boer War from Lindley in Orange Free State, South Africa. The second song. Autumn. highlights the difference between pre World War I cavalry fighting and trench warfare, incorporating the ‘gone, gone again’ theme from an Edward Thomas poem. In the middle of the chaos of going ‘Over the top’ in Song 3 comes a strange moment of calm: when ‘five-nines’ (German 5.9 inch artillery shells) were fired, there was an eerie moment when you could hear them coming but did not know where they would land – and explode. The whizz-bangs in verse one are German high-velocity artillery. ‘Hold hard!’ (Song 4) was the rallying cry of Colonel Percy Evans-Freke of the Leicester Yeomanry who led and was killed with many of his troops at the Battle of Frezenberg (Belgium) in May 1915. The names in the central stanza of song 5 (Remember me) are taken from the Leicester Yeomanry War Memorial in Oakham Castle to the memory of those members of A Squadron Leicestershire Yeomanry who gave their lives during World War I. Colonel Evans-Freke’s name heads the list. Small sacrifices (Song 6) concentrates on the women of the war, the nurses and the calmness they could bring even as death approaches. It also pits war against the beauty of nature and the majesty of the night sky. The final song, Wildflower Meadows, is a sonnet. We are brought back full circle to the summer of verse 1 – but to a happier, more forward-­‐looking summer. We have inherited the earth from those who have gone before, commemorating here especially the dead of World War I, but we tenant it for future generations too. 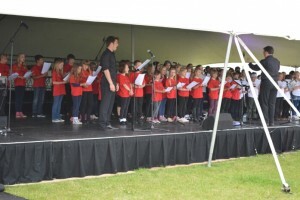 Rutland Music, the music hub for Rutland, is charged with implementing the National Plan for Music Education in the county. Responsibilities include widening young people’s access to singing and instrumental education and participation opportunities. 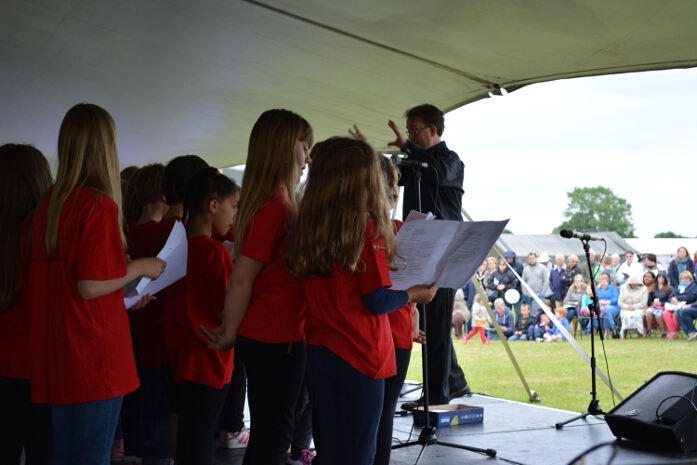 The Wildflower Meadows project has involved 78% of the county’s primary schools and within these over 500 Key Stage 2 pupils have been supported to learn the commemorative piece, singing it both in school and at countywide joint rehearsals. Today’s performance is the culmination of this project and the world première of Wildflower Meadows. 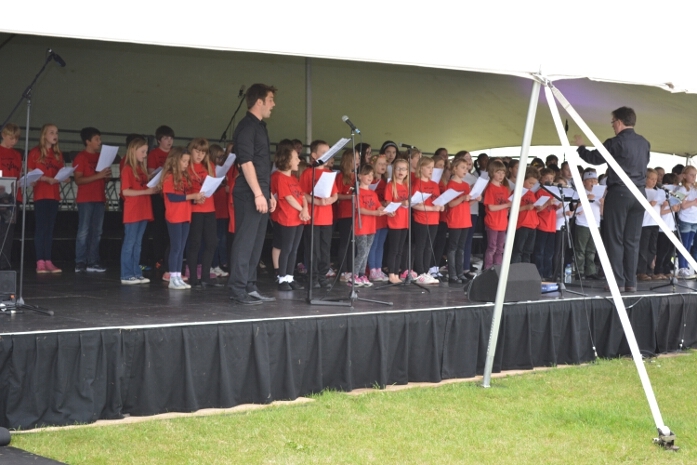 The project has also been the launch pad for a new county youth choir, Rutland Voices, formed in May with members from most Rutland primary schools. Rutland Primary Schools taking parting the Wildflower Meadows project included Brooke Priory, Catmose Primary, Cottesmore Primary, Kendrew Barracks, Empingham C of E Primary, Exton & Greetham C of E Primary, Great Casterton C of E Primary, Ketton C of E Primary, Langham C of E Primary, Leighfield Primary, Oakham C of E Primary, Ryhall C of E Primary, St Nicholas C of E Primary, Cottesmore, Uppingham C of E Primary and Whissendine C of E Primary. Hey ho! Hey ho, with a ding dong bell! With a hey nonino and a ding dong bell! Old Lindley’s chimes urge yeomen to the task! Its moat a meadow; walls sweet vernal-grass. Hear the call and mobilise! Mobilise! And a patch of the infinite sky. Old Lindley’s chimes urge freemen to take arms! To save the young, the old, the frail from harm. On every brow a brass gleams bright. Where casting hounds nose out a fox. Heavy autumn clouds of wheaten grey. Dissolve in noisy, soaking squalls. Dark servants of the wind and rain. Splitting thunder clouds that rage and burn. Till nightfall comes with stinging hail. Like children playing tag beneath the trees. And gets to Oakham just in time for tea. A hollow blast! The swishing shell explodes! Wakey wakey! Rise and shine! Rise and shine! Let death be peaceful. Death be quick. And no use turning back: press on! Over the top! Over the top! And strewing the ground with the dead. Who thought so many could die? So many dead, so many dead. We cheer and shout like madmen! Hold hard, the yeomen, hold hard! Shoot first, shoot true, shoot purposely. It robbed me of a tooth it did! Thank God for my luck, thank God! Fast fading out of sight. Lost, lost in endless night. Toll, toll these passing chimes. Forget them not, forget them not. In Flanders fields they lie. In Flanders fields they died. That gently show the way ahead. Instilling strength and calming fears. Enlisted as a drummer boy. His cheerful chatter spreading joy. His heart is touched with blessings mild. To dwarf the flashing cannonade. A soldier hums Abide with Me. Hope gains a hard-­‐fought victory. With unschooled woodnotes, boisterous and true. Reflect on those who left this legacy.